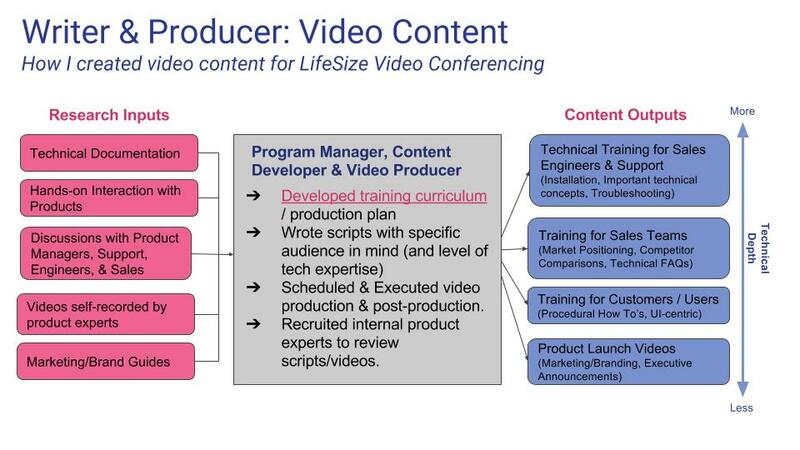 I developed and ran the Training Video program at LifeSize (a division of Logitech) for 2.5 years, which included everything from curriculum development to script writing, from filming to editing. I created video-based training programs for 3 main audiences: End Users, Internal Support/Sales, and Partners' Networks Administrators. I maintained close contact with my co-workers across the company (Marketing, Product Management, Sales, Support, Engineering) to ensure that our training was up-to-date and responsive to the learning needs of our varied audiences. I helped develop the curriculum for all courses. I then researched and wrote scripts, scheduled and filmed footage, edited the video, and then coordinated the review process. Then finally, I uploaded and maintained the videos on our LMS (Cornerstone for Salesforce). Established an in-house process to quickly dub videos in a myriad of languages using Adobe Premiere. Organized a quarterly, cross-departmental review of our existing training videos. Figured out how to set up easy process inside of LMS. Initiated and coordinated moving Training Department to Google Drive/Calendar for shared collaboration. Became integral to team functioning. Target Audience: LifeSize Sales Engineers & LifeSize Partner's Network Administrators. View my original Technical Training Curriculum document on Google Drive. The simplified on-screen interface makes the LifeSize Icon Series an easy and intuitive experience for the user. But don’t worry; we didn’t forget about the administrators! In upcoming episodes, we’ll explore the completely redesigned administrative interface. First, let’s look at an overview of the key technical specifications you’ll need to know. Simple to use and simple to administer. Let’s highlight the key tech specs for the LifeSize Icon Series. - UVC Manager, which enables meeting reminder pop-ups, schedule integration, and population of the directory. - UVC Video Center, which enables video recording and streaming. The Record option appears in the on-screen interface when Video Center is activated. • Additional licenses are required to enable dual displays and 1080p send and receive while in a video call. Congratulations on your purchase of a LifeSize video conferencing system! Let’s go over some of the video conferencing terminology you’ll hear during our series. The first term is “IP Address”. Think of this as your phone number for video conferencing. The second term is “Point to Point Call”. This means that you are communicating with just one other person on your video call. The third term is “Multi-party” or “Multi-way” call. This means that there are more than 2 people on the video call. With the LifeSize Icon Series, multiway calls are hosted on a Bridge, which is our fourth industry term. When designing the LifeSize Icon Series, our engineers took a step back to re-examine the user experience. This resulted in a radically simplified user interface that’s geared towards making video conferencing natural and easy. First, let’s take a quick look at the remote control. When creating a video training course at LifeSize, I'd research using a variety of internal sources (pink), then develop and execute (gray). I produced a wide variety of content (blue). Bryan Seely is a famous hacker, best known for the time he used Google Maps to hack the Secret Service. He wanted to create an Ethical Hacker course to sell on Udemy.com. He provided me with the curriculum and a bunch of sources on hacking (Chapters from books, PDFs, links). I read Bryan's provided sources, researched key concepts more, and wrote the voice over scripts for the entire course. It was important to Bryan that his sense of humor was incorporated too, so I interwove lots of little jokes which he loved. I provided guidance on course development / direction based on my experience developing Training courses. I audio edited Bryan's voice over using Adobe Premiere and Adobe Audition. I wrote a lot of content for digital agency Sitegoals' quoting software, Quotingly -- website copy, blogs, and video scripts. Additionally, I created this series of training videos that walks step-by-step through setting up a brand new Quotingly user. Wrote scripts by using the Quotingly product and based on the provided branding/messaging. Recorded all the UI using Camtasia. Edited using Adobe Premiere and Adobe After Effects. We already looked at the Deliverables options in our last video, so let’s click on the Adjustments tab. Here you can add in adjustments, like a percentage discount. Let’s add a friends-and-family discount of 10%. We’ve also added a flat rate discount: a coupon for $50 off. We’ve added a rush multiplier, which allows us to multiply the above sum by any number; and, then sales tax, in this case 8.25%. We also have the option to put a flat Rate in here. The project subtotal right now is $6040, but we can say: “Well let’s go ahead and give it to him for $6000,”and you can see that it puts a flat rate adjustment in there, and then calculates in all the other adjustment to our final price of $8687.06. Now, let’s look at the Overview tab, where you can see a big picture view of your entire project. At the top, you have your client name, your project number, and your project name. Then you have any adjustments that you made, followed by the total estimated time and estimated price. Then it is broken down by categories, deliverables, and options. For each one of those you have the total hours and price for each level, and then a detailed breakdown of hours and pricing beneath that. At the bottom of the page is the Price Sheet. The price sheet shows you the different people or the roles checked off in the deliverables list, with how many hours each of those roles are assigned and what their hourly rate is.